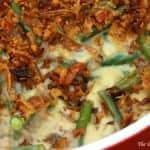 Featured in magazines across the web and consistently rated THE best green bean casserole EVER, this recipe will convert even the most determined green bean haters! 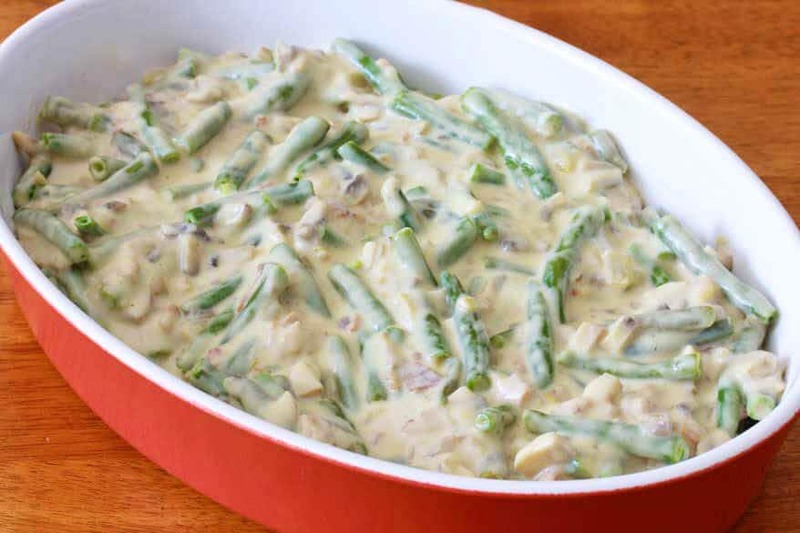 Tender green beans, bacon, cheese, cream, mushrooms and more, this deluxe casserole is made from scratch and is guaranteed to become your go-to from now on! The quintessential American side dish for family gatherings, holidays, church socials, potlucks…the recipe clipping that virtually ever American woman has had lying somewhere at some point throughout the past gazillion decades. Only this one is different. This one’s the best. Ever. And it’s made from scratch. If up until now you’ve just been kind of “meh” towards green bean casserole, prepare to experience a major paradigm shift in attitude. This isn’t your Aunt Betsy’s green bean casserole. A developed this recipe a couple of weeks ago when I had about two pounds of fresh organic green beans that I needed to use up. I posted about it on my Daring Gourmet Facebook Page and on my readers asked me about a recipe for a green bean casserole. So I made two dishes using up those green beans: Southern-style Green Beans with Caramelized Onions and Bacon and this green bean casserole. The bacon complemented the green beans so beautifully in the first dish, so why stop there, I thought? Everything tastes better with bacon, right? Yes, let’s just combine them all. 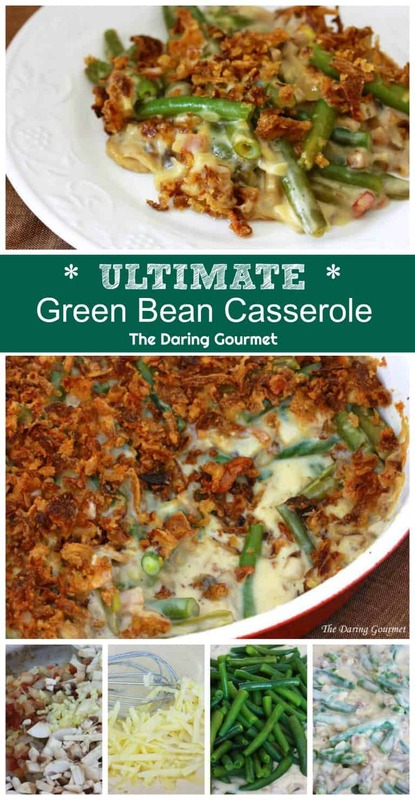 Ultimate Green Bean Casserole. The outcome was so fabulous that I made it again two days later for Thanksgiving. And the proof in the pudding, so to speak, was when my brother tasted it. My brother has hated green beans since he was old enough to say the word. He has never relented to eating them. Ever. No exceptions. But he ate this. He ate this! Seriously, I don’t think you understand how monumental that is. He ate it…and he liked it! Yes. Ultimate Green Bean Casserole. The best. This recipe take a little longer than the 2 minutes and 38 seconds required to open a can of condensed mushroom soup, mix it with water, toss it with green beans, dump the mixture into a casserole dish, sprinkle with French fried onions, and put it in the oven to bake (ie, the classic recipe first introduced by Campbell’s in 1955). But this Ultimate Green Bean Casserole is still quick to make and to say that there is no comparison between the two is an understatement. This isn’t called “ultimate” for no reason. You’re going to love this version and it’s destined to become your new go-to recipe for green bean casserole. Don’t miss out on the latest recipes, be sure to SIGN UP FOR OUR NEWSLETTER. No spam, ever. 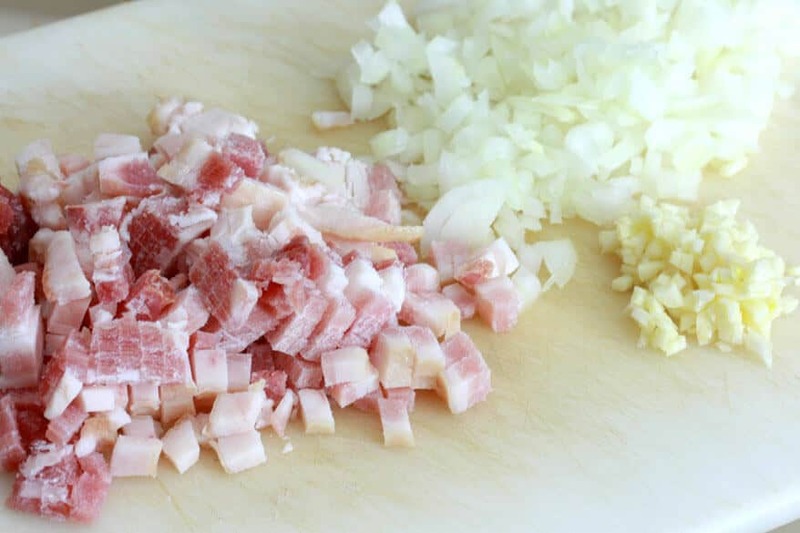 Chop up the bacon, onions and garlic. Tip: Bacon is much easier to dice while it’s still frozen. Fry the bacon in a large skillet over medium-high heat until crispy. Add the onions and cook for 4-5 minutes until soft and translucent. Add the mushrooms and garlic and cook for 4-5 minutes until the mushrooms are soft. 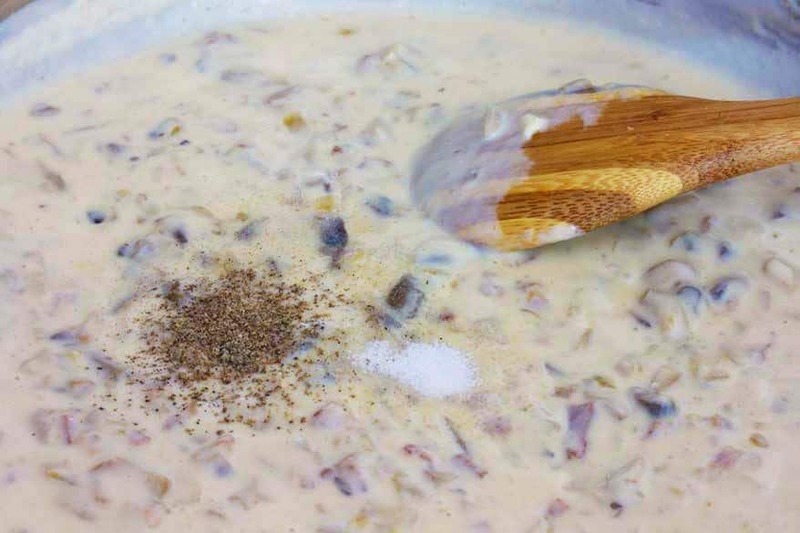 Transfer the bacon/mushroom mixture to a bowl and set aside. 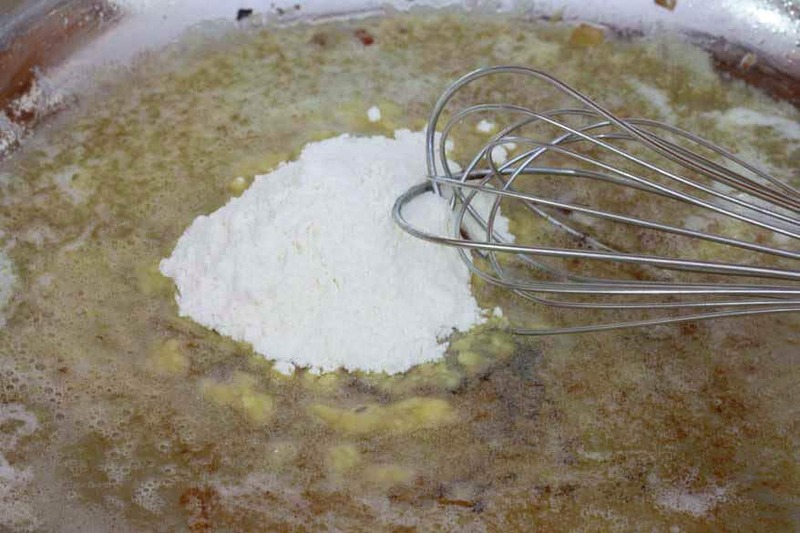 Melt the butter in the same skillet, add the flour, and whisk until combined. Continue whisking for another minute until the mixture has slightly deepened in color. Whisk in the half-and-half and chicken stock and continue to whisk, letting the mixture simmer, until it has slightly thickened. Whisk in the white cheddar cheese until combined. Add the bacon/mushroom mixture and stir to combine. Let the sauce simmer for a couple of minutes, stirring frequently. Add the blanched green beans (see recipe box for instructions on blanching). Pour the mixture into a 9×13 inch casserole dish. Since this is a made-from-scratch version, don’t go using nasty hydrogenated oil-packed French fried onions. There are several good options out there. I had two in my pantry to choose from. I went with Lars’ Crispy Onions this time. Sprinkle all of the French fried onions evenly over the casserole. Bake, uncovered, for 30 minutes in an oven preheated to 350 degrees F.
The BEST green bean casserole. EVER. Fry the bacon in a large skillet over medium-high heat until crispy. Add the onions and cook until soft and translucent, about 4-5 minutes. Add the mushrooms and garlic and cook for another 4-5 minutes until the mushrooms are soft. Transfer the mixture to a bowl. Melt the butter in the same skillet and whisk in the flour. Once combined, continue whisking for another 2 minutes until the mixture has slightly deepened in color. Add the half-and-half and chicken broth while constantly whisking to prevent lumps. 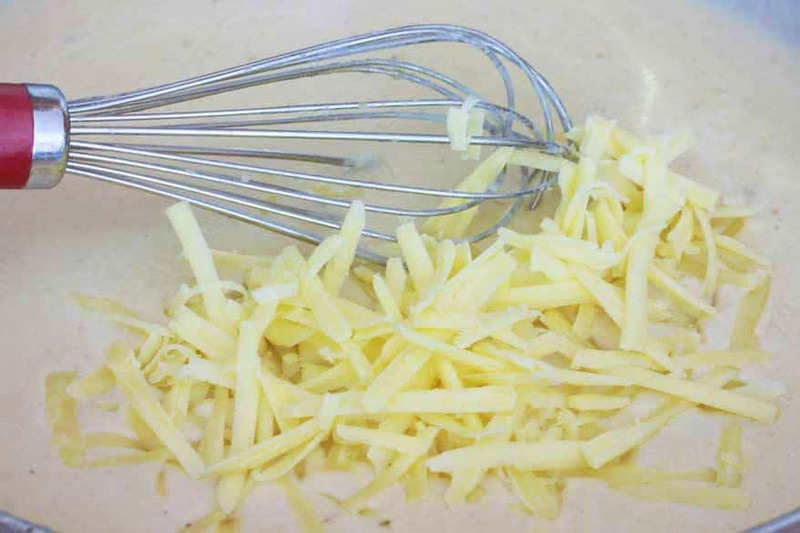 Once slightly thickened, add the cheese and whisk until melted and combined. Next add the mushroom/bacon mixture along with the salt and pepper. Let the sauce simmer for a couple of minutes, then add the green beans. Stir to combine. 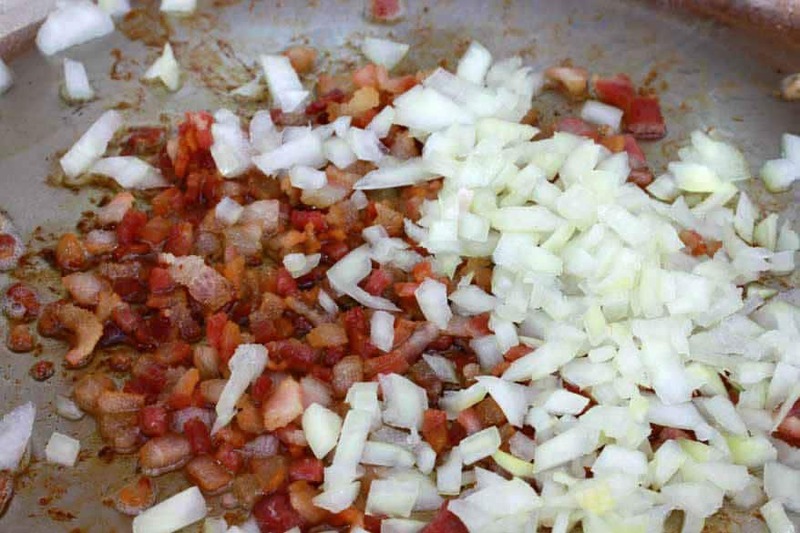 Pour the bean mixture into a 9x13 casserole dish and sprinkle the French fried onions all over the top. Bake uncovered for 30 minutes. Preparing in Advance: Everything can be done in advance except for adding the crispy onions, otherwise they'll get soggy. Add those just before baking. Also, let the casserole sit for at least 30 minutes after removing it from the fridge before baking. I can tell just by reading the recipe that there is no comparison between this and the stuff made with canned mushroom soup. 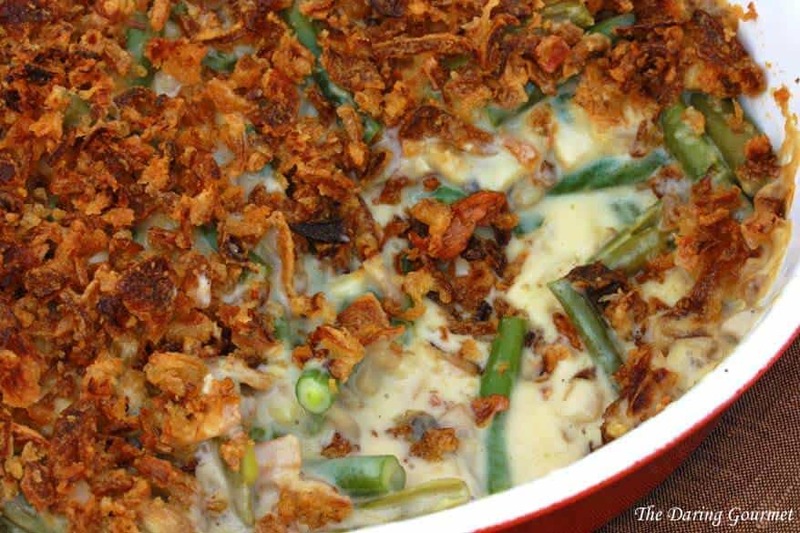 My sister loves green bean casserole, so I will make sure she gets this recipe. Thanks for passing this on to your sister, Susan! Thank, Nick! Yes, you can make them in advance but leave them unbaked and don’t add the onions until tomorrow. Pull the casseroles out of the fridge and let them sit at room temp for 20-30 minutes, add the onions and then bake. Merry Christmas! 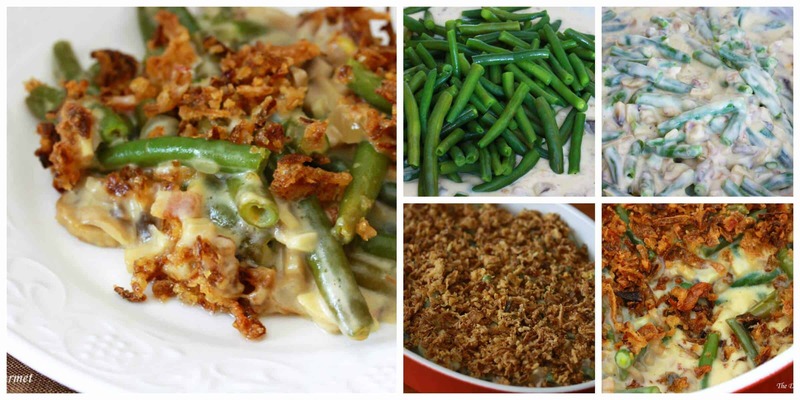 This is my absolute favorite green bean casserole recipe!!! My family has ORDERED me to make it again for Thanksgiving and Christmas this year :) Thank you, Kimberly! I can not wait to make this. I can not get condensed soup in Germany and have tried making it with powdered soup, but it does not work as well. 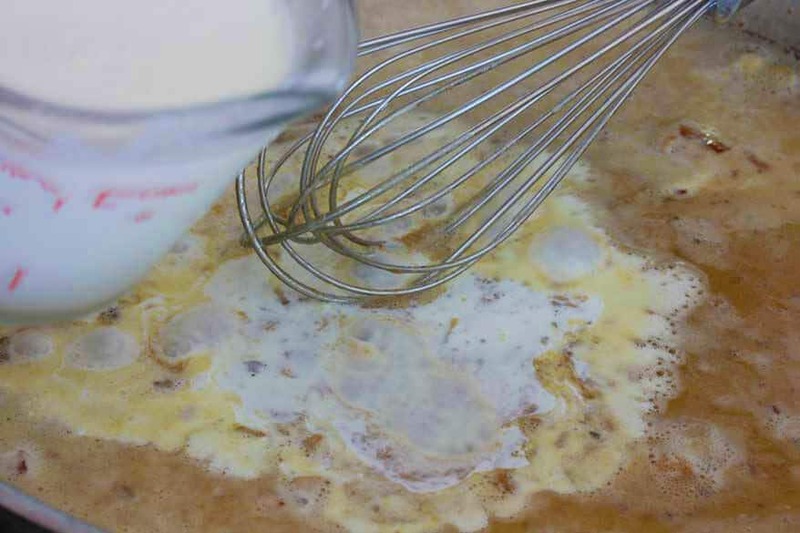 I never thought of just using a white based sauce – well a jazzed up white base sauce! Thank you. Hi Beth! Fantastic, I’m happy you’re making this! Whenever you get to it, let me know what you think. In the meantime, have a wonderful Christmas in Germany! In my opinion there just isn’t any place like Germany for enjoying the Christmas season – it’s magical. If you haven’t already been to Rothenburg ob der Tauber for the Christmas market and for the Kaethe Wohlfahrt store (talk about magical! ), it’s a must! The Christmas market there isn’t one of the bigger ones, but it’s my favorite of all them because of the atmosphere. I love Rothenburg! I am dying to try this! I make a similar version and add a pinch of nutmeg, makes all the difference! I can’t wait to do this with bacon and cheese! Thank you for all your time and wonderful recipes. Oh, isn’t that the truth! It’s like I’ve been saying ever since getting back from my deep South vacation: The Southerners do it best – everything with bacon or bacon grease! :) Thanks so much, Carmel Moments, and thank you for visiting! Thank you, Nita, and welcome! You know, I really don’t know a whole lot about what kinds of vegan products are out there. I know there are vegan cheeses, and I would imagine there are probably vegan substitutes for cream as well. For the chicken broth simply substitute vegetable broth. And for the bacon, there are also vegan “bacon” products available. Good luck! I actually did a research on how to make this dish without dairy and soy because my friend who invited us over for X’mas can’t take them now due to her baby allergies. Looks like coconut milk can be the best bet to replace half-and-half. We’ll see. Daiya cheese is really the only option to substitute cheese…cheddar though…oh well. I cooked Christmas dinner this year for my in-laws who are old-fashioned not only in their life style but in their diets. I knew whatever I made had to be traditional and something they were familiar with, so what’s more traditional than green bean casserole! I tried this recipe and they loved it! We all loved it! That’s wonderful, Jeanie, I’m so happy to hear it was such a hit! Thanks for your feedback! FYI – I did make this dish with coconut milk and Daiya cheese. It was still delicious, and coconut milk did not bother anyone. However the fake cheese didn’t melt as its package says! Sad to see cheese swimming in the sauce! Still enjoyable, so thank you. That fact is, nobody who had the dish was used to fake cheese. My friend was recently forced to go without dairy or soy due to her baby’s allergies. Bacon was actually used! Maybe that saved it. Still everybody liked the dish…you should be proud! BTW I did give away the fake cheese to my friend after that. Next time I totally will follow your recipe, exactly. hey…. are these store brought French Fried Onions- or do you have a recipe for these??? Hi Karen! Yes, they’re store bought – if you scroll down through the prep pictures you’ll see the ones I used (some fantastic ones imported from Europe with no junk ingredients). I make most everything from scratch, but there are some items, like with these, where they’re so good store bought, and made with clean ingredients, that I save myself the time and use them. I made this this week. I made a vegetarian version (no bacon, vegetable broth) for my daughter and the baconlicious version for the rest of the family. They loved it!! Even the carnivores liked the veggie version. Thanks so much! Made this for Easter and had to email the recipes to everyone as they LOVED it!!!! I wanted to make a Green Bean Caserole but did not want to use a soup!!!! This is now my FAV!! Fabulous, I’m so happy it was such a big hit! Thanks for the feedback! This was absolutely fantastic! I’m such a big fan of green bean casserole and have been craving it, but didn’t want to settle for the boring and processed traditional recipe, and wanted to utilize the fresh green beans I just picked up from the market! I served it with a grilled ham steak, and made a glaze with 1/4 cup fresh maple syrup, tablespoon dijon mustard, and tablespoon cider vinegar. Christmas in July! Yum!! Tiffany, that sounds fantastic and your family/friends are a lucky bunch! You’ve got me seriously craving that entire meal right now :) So glad to hear the casserole was a hit and thank you for the feedback! First time making a green bean casserole, used to shudder at the thought. Coming from a Greek family, we only made fresh green beans sautéed in tomato and onion sauce. You recipe came out incredible and I used our green beans fresh from our garden. Thank you for a splendid recipe. I’m so thrilled to hear that, Elena, thank you! And how wonderful that you were able to use those magnificent fresh green beans from your garden! This recipe was a complete success. The first time I made it, I didn’t have quite enough of this, and had a little too much of that, and it came out fantastic anyways. It was so popular that it was immediately requested again three days later. I get my green beans from an Asian market as they are generally higher quality than the Walmart variety when the finished product is done. However, they require more cleaning and much more aggressive end removal. So, I wound up making this in huge batches and freezing up to 4 casseroles for a “month’s worth”. This works really well as long as the mushrooms are fully cooked- I let the pre-green bean mushroom soup simmer longer than given; I leave the onion topping off until right before they go into the oven. As long as it’s fully defrosted, the cooking times are the same if not shorter. We haven’t been able to notice any decrease in quality, and this is practically a meal in and of itself. We tend to do batch cooking on a few days out of the month, and I was so happy that we could do it with this! 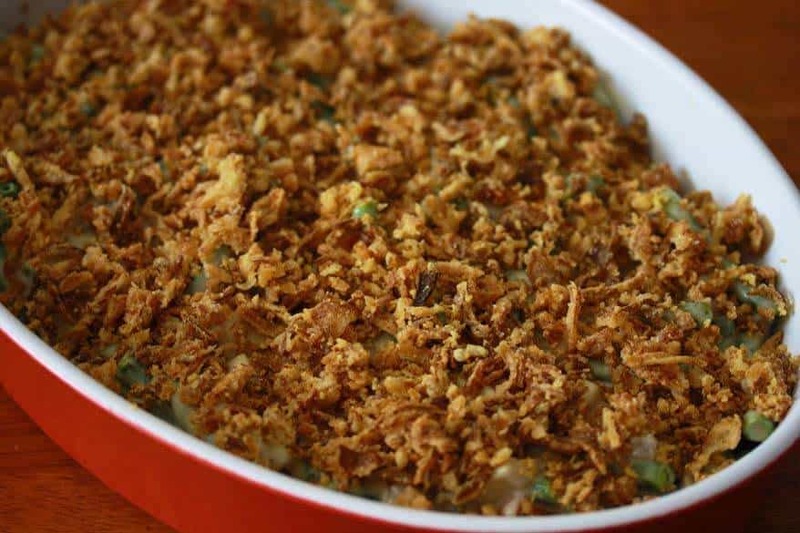 My sister has always been a green bean casserole fiend, but her husband hated them. This recipe went over equally well with both! I was so excited to find this website as well; we are looking forward to trying all sorts of your other recipes. Just a note – your ingredient list doesn’t include the crispy fried onions. Fortunately, I had read the whole blog (how could I not when the pictures are mouth watering!!) but when I got to the store with the list, I saw no onions.. Luckily, I remembered them from your pictures! Thanks for catching that, I’ve added it to the list of ingredients! I always buy fresh green beans but I ventured out the other day and bought frozen from Trader Joe’s. Can I use those for blanching or should I buy fresh? Hi Stacey, nothing beats fresh but frozen is a great alternative and will do the job beautifully. They’re already blanched so all you have to do is thaw and thoroughly drain and they’re ready to use. Happy cooking! Can this be made the night before and be refrigerated so that it is ready to bake the next day? Hi Liz, yes it can! Just wait until the next day to sprinkle on the French fried onions when you bake it so they’re nice and crispy. This looks AMAZING! I plan to make this for our work Thanksgiving potluck this Friday and then for my family Thanksgiving! Would you say this recipe is easily doubled/tripled? Thanks so much, Madalyn! Yes, it can very easily be doubled/tripled/quadrupled :) It can be assembled in advance, too, just wait to add the French fried onions until you’re ready to bake it so they’re crispy. Happy cooking! That’s wonderful, Masumi! You and your family are going to love this! It’s not necessary, but if possible wait until you get to your dad’s house to sprinkle the onions on and bake it there so the onions are crispy. If that’s not possible it’s not a big deal, but the crispy onions are always ideal. Hi! If I double the recipe, does it change the baking time? Hi Amy, no you won’t need to change the baking time. Happy cooking! Con: You can’t get enough of it. AGREED, this green bean casserole is THE BEST!!!!!!!!! I can’t wait to make this for thanksgiving! One question, can I make and combine the night before? Hi Tarantini, absolutely! Everything can be assembled and then baked the next day, just wait to add the French fried onions until you’re ready to bake it so they’re nice and crispy. Happy Thanksgiving! What about using frozen green beans? Does it change anything? Yes, you can absolutely use frozen green beans. Just thaw and drain them first (no blanching needed). When it says it serves 6, is that as a Thanksgiving side? If I triple it for 15 people it that way overdoing it? Yes, that’s for 6 side servings. Tripling it probably won’t be overdoing it. Making this for Thanksgiving tomorrow, it sounds insanely delicious!! Thanks, Kelly, enjoy and Happy Thanksgiving! Super sweet, Audrey, you ROCK!! Happy Thanksgiving! I have never liked green bean casserole, always used to refuse to eat it. This recipe was a total game changer. AMAZING!! I put this casserole together this afternoon and have it ready to top with onions and bake tomorrow before my family’s Thanksgiving meal. It looks beautiful – so much prettier than the traditional version already with bright-green beans. I can’t wait!! Wonderful, Pam! Have a terrific Thanksgiving and when you have a moment please let us know what you and guests thought of the casserole! In the oven now… Tasted the sauce and it is amazing! Thank you for sharing! Can’t find shredded white cheddar last minute… Would an Italian blend work? Sure, that will work, Gina! Happy Thanksgiving! This looks delicious! I am hoping to make this for thanksgiving tonight, but my uncle is on a gluten free diet. Is there a way I can not add the flour to the sauce? Or use something else instead to thicken it? Thanks! Hi Leia! Absolutely, you can use cornstarch instead of flour. It will only slightly alter the flavor (you won’t be getting the nice flavor from the butter-flour roux), but it will still taste 100% awesome. So, use 1/2 the amount of cornstarch as you would flour and skip the part where it says to whisk it in with the butter. You can still melt the butter (butter makes everything taste better) but then mix the cornstarch in with the chicken broth until dissolved and simply pour the half-and-half and chicken stock/cornstarch mix into the pan with the melted butter and then whisk to combine and thicken as it simmers. Happy Thanksgiving and let us know what you all thought of the casserole! I made this recipe exactly how you stated for Thanksgiving tonight. It was a huge success!! My family is very traditional in their cooking and everyone raved about it! My one and a half year old son was definitely the biggest fan! Thank you so much for a wonderful, fresh recipe! I’m so happy to hear that, Shauna, and greatly appreciate your taking the time to let us know how it went! Thank you! Made this for thanksgiving today, had multiple “best green bean casserole I’ve ever had” comments. Thank you so much for the awesome recipe! Fantastic! So thrilled it was such a hit and I really appreciate the feedback, Adam, thanks! I made this and it was awesome. I was doubling the recipe, so I did the 2 c. half&half, and instead of 2c. broth, I did 1c. broth and 1c. white wine. It was incredible. I also made fresh fried shallots from scratch instead of prepared fried onions. It was a hit, thanks for the great recipe! Awesome!! So glad it was a hit and I really appreciate the feedback, Angie! Hi Kim, we are soo excited to try this out. We don’t cook a whole lot so I was wondering if leaving the mushrooms out would change it much? (My daughter will not eat mushrooms for nothing). If so, is there something we could replace them with to still give it the taste? Hi April! Yes, you can simply leave them out. 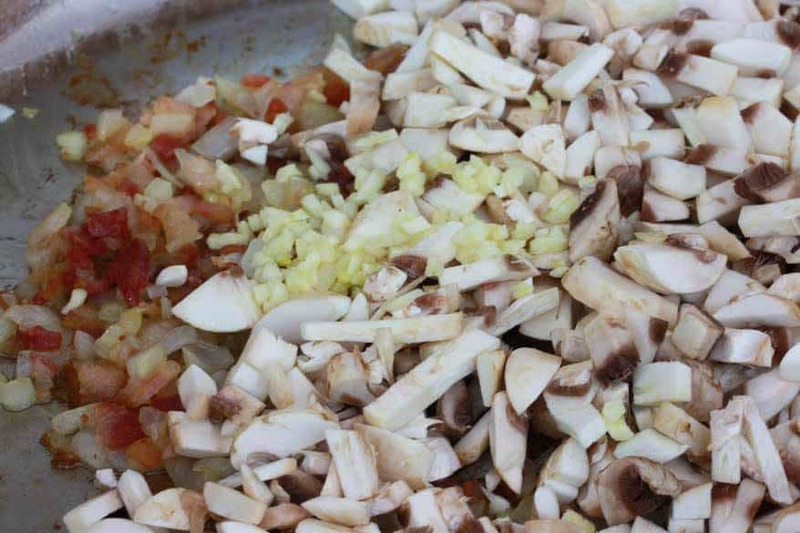 There really isn’t a substitution for mushrooms or the mushroom flavor, but this casserole will still taste great even without them. Happy cooking! I made this for thanksgiving this year, and my family is not big on green bean casserole. They hate anything “soupy” or with a lot of sauce in general, so I made one recipe except put the sauce over two pounds of green beans instead of one. I was also generous with the bacon and mushrooms. It was a huge hit, and they requested it again for Christmas dinner! Fantastic! So glad to hear that, Gina, and I appreciate the feedback! Merry Christmas! Hello, this sounds amazing! Can this be prepared the day before and baked the next day? Thanks! Sure can, Vincent! Just add the French fried onions last right before you’re ready to bake it so they don’t get soggy. I made this for a large group and it was hands down the favorite. Will never make it the “classic” way again! Amazing recipe! Thanks for sharing! That’s awesome, Rachel, so glad you liked it, thank you!! We LOVE this recipe, it’s the absolute BEST! Hi Yolanda! That’s a great question. I’m not sure, I’ve never tried making this in a slow cooker. My guess is that it will alter the consistency. Also, in order to get the onions on top to be crispy it has to be baked in the oven – doing it in the slow cooker will make the onions very soggy. Hi Connie, everything can be made in advance except for the crispy onions (otherwise they’ll get soggy). Sprinkle on the onions just before you’re ready to bake it. Happy Thanksgiving! Do you think I could substitute broccoli for the green beans? Hi Cory, absolutely! That’s a great substitute for any green bean haters among your guests. Can I prepare this the day before? Everything but the crispy onions, Kelly, or they’ll get soggy. Add those just before baking. This recipe sounds amazing, just wondering how I can make this dish for 12 people without compromising the flavor. Any ideas? Hi Suzy, simply double all the ingredients and divide it between two casserole dishes and it’ll be perfect! Happy Thanksgiving! Another question, how long would you recommend the bake time to be if I make 2 dishes? Hi Suzy, if you’re baking two separate 9×13 casseroles side by side in the oven at the same time the total baking time is still the same (30 minutes). Hi Kimberly, I love this recipe and cannot wait to make for thanksgiving this coming week. I have seen nutmeg added to some green bean casseroles, you thoughts on this? How much and at what point? Have also added chopped water chestnuts to other gbc casseroles w nice crunch effect. Your thoughts? Hi Linda, thank you! Sure, I think a little nutmeg would be fine. A little goes a long way, so I’d just add a small pinch, like 1/8th teaspoon or slightly more. Water chestnuts won’t interfere with the flavor since they have none, they just add texture, so if you like some crunchiness in the casserole go for it! Happy Thanksgiving! Made this for an early Thanksgiving and my dad declared it the quintessential green bean recipe against which all other green bean casseroles should be measured :D THANK YOU!! It really is amazing. 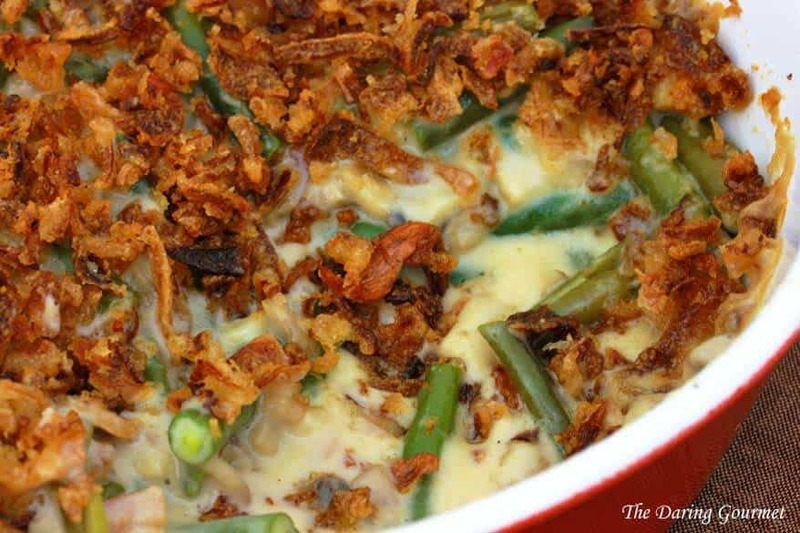 Holy cow, this is THE BEST green bean casserole EVER!!! I will be making this again for Thanksgiving and for every Thanksgiving every year from now on. Seriously, THANK YOU!! That’s awesome, Krista, I’m so glad you enjoy it as much as we do and I really appreciate the feedback, thank you! OMG!!!! As a born and bred southerner, I love green bean casserole but now that I’m an adult and in charge of Thanksgiving I wanted to trade the canned version to a fresh version (can’t serve canned GB casserole with Barefoot Contessa sides!). I normally wouldn’t try a new recipe the day before Thanksgiving but I am soooooo glad I did!!!! This recipe is OUT OF THIS WORLD!!!!!! Thanks so much!!!! It is now a new staple on my holiday menu. It’s literally the best recipe ever and will go GREAT with my Cajun fried turkey! So glad I found your site!!!!! BY far the absolute best recipe I have ever used. I made this in advance and could NOT stop eating it! I can’t wait for my family to try this tomorrow at dinner!!! The only modification I would make is don’t add the additional salt! I added it and it’s a bit too salty but still delicious!!!! Thank you!!!!! Awesome!!! So glad to hear that, Jen, thank you! I just bought all the ingredients for it today myself and will be making it for tomorrow! :) Happy Thanksgiving! My wife and followed this recipe, but after mixing everything together, we realized we accidentally bought MAPLE bacon. We’re not cooking the casserole until tomorrow right before thanksgiving dinner, so we don’t know how it will turn out or if we need to start over. Do you think it will still taste ok with maple bacon? Hi James, I think it will be perfectly fine! All the maple bacon I’ve had has been very subtle in flavor and even if a bit of maple comes through I don’t think it will hurt the dish any. Happy Thanksgiving! This is so much better than the traditional open a can of soup version! It takes a little prep time but if you make it a day ahead it works! I will never make any other way from now on!! Thanks, Selena, I’m glad to hear that! :) I just made mine this evening and tomorrow I’ll sprinkle on the onions and pop it in the oven! Happy Thanksgiving! This dish is amazing, made it for a thanksgiving get together and even 3 of the guests who do not like green bean casserole loved it! So fresh and delicious! I used french style green beans and it was perfect! So much better than the canned over salted version! Fantastic! This casserole has managed to win over quite a few otherwise green bean-hating people, my brother included. So happy to hear it won over your guests! Thanks so much for the feedback, Katrina! Thanks again! I’ll be scanning your site for more great recipes!! I made this last week for Thanksgiving at our farm in Sequim,(after I saw Jeanie’s recommendation) and everyone absolutely LOVED it!! I will never go back to using canned soup and canned green beans – this is so very much better. Thank you Kimberly! Hi Janet, so nice of you to drop by! :) I’m so happy to hear this was a hit. Thanks so much for the feedback and give our love to the family! I followed your recipe and made this for Thanksgiving and it was amazingly good! I ended up using milk instead of cream because that’s what I had, but it was still plenty decadent. I want to try the pumpkin sausage gravy + biscuits next! I like the format of your recipes too, the large photos help a lot. Thanks! With the exception of the fried onions, can you prepare everything and put it in a backing dish and then thaw in advance of backing/serving? Yes exactly, Liz. I wouldn’t recommend freezing the casserole though (a texture thing), but keep it refrigerated and then let it sit at room temperature for 30 minutes before baking and wait until the very last minute to add the onions before putting it in the oven. I have always thought green bean casserole was a disgusting forbidden dish. I was looking for a hearty side recipe to use green beans and found this. 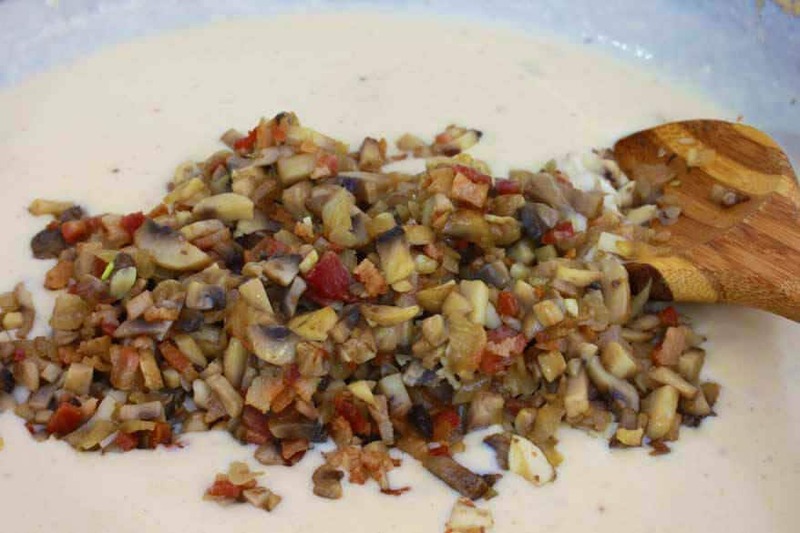 No cream of … soup… bacon, mushrooms..what’s not to love? This was AMAZING! I can’t wait to make this for my family for the holidays. It’s homey but full of flavor and fresh! Love it! Yahoooo! I’m so happy to hear that, Chris, thank you! Where did you purchase your Lars onions from. That link you have on your blog want $44.00 and I’m not paying that out rageous price for them. I’ve made this recipe for the past 2 years & everyone loves it. I tweeked it. Instead of using white cheese, I use harvarte, grueyere & gouda cheese. I make my onion rings from scratch. Oh my goodness….. it’s so heavenly! This year I’ll do the same but add pancetta to the mix. Thanks for this fantastic recipe! That sounds heavenly, Ana, thanks for sharing and I’m so glad this dish has become a tradition in your home! I made this dish last Thanksgiving and boy did my family love it! And this year they’re telling me to make it again…..but I’m like oh shoot I didn’t save the receipe…….thank goodness I found it! And I’m definitely saving it this time! I cant tell you all how good this is!!! I made it last year for Thanksgiving & now my family requests it for every holiday!!! I have actually made a vegetarian version of this as well & it turned out great…me personally I like it just the way it is with a little extra bacon!! Try it … you WONT be disappointed!! Love this recipe as an excellent alternative to canned soups. I tried this in a slow cooker to see if I could make the recipe feed the masses (doubled), the answer is no. Bake it in the oven. You could MORE than likely fit a doubled recipe into a 9×13 pyrex glass dish and bake. The slow cooker ruins the texture and consistency of the casserole (steam and uneven cooking). Great recipe otherwise, the bacon and white cheddar add a decadent extra layer that is otherwise missing from this traditionally canned soup casserole. Take it easy on the saute heat, I burned the bacon and onion (doing something else) in the pan and while it tasted great, it took on an unpleasant color when the liquids were added and the pan was deglazed. Hi Jonathan, I agree with you about the slow cooker. Baking it is the only way to go. So glad you enjoyed this and appreciate the feedback, thank you! Can I make this (with the onions left off until bake time) and freeze it a couple of weeks before without compromising the flavor/texture? Wondering if anyone has tried this? Thanks! Hi Laura, I haven’t tried that so I’m not sure how that would impact the texture. I’ll leave this question open to anyone else who has tried freezing it prior to baking…. Thank you for sharing this delicious recipe. It now my specialty for thanksgiving dinner. Everyone loves it!!!! 5 Stars!!!! That’s super, Liliana, thanks so much! Hi Barbara, any brand of crispy fried onions will do perfectly (they’re typically called “French fried onions” though not always). Are you referring the specific brand “French’s” when you ask about the onion rings? I’m not familiar with French’s making them in onion “rings” form, but if they do that’s no problem either – just break them up in your hand and sprinkle them over the casserole. Can I make this two days ahead of time and keep in the fridge til I bake ? Two days should probably be okay, Daisy. Then add the onions just before you bake it. I made this for a work potluck. They loved it. I added some paprika to it because they like spicy food. Perfect, Karen, thanks so much for the feedback! 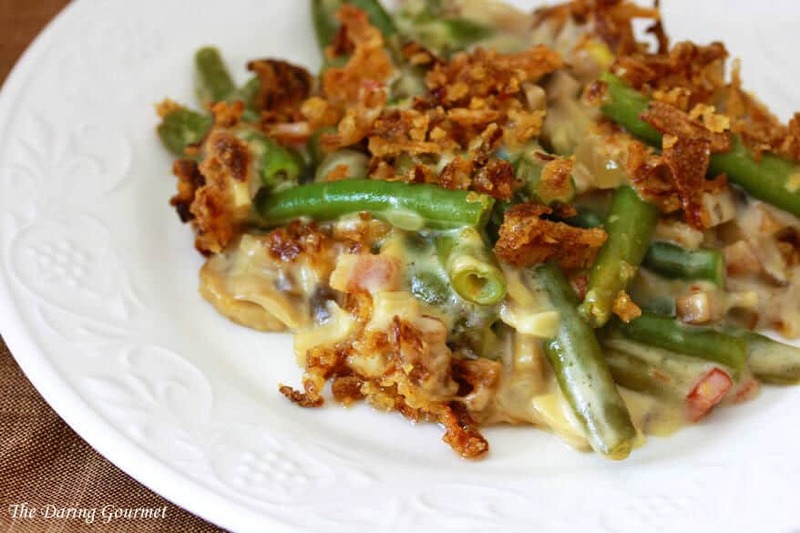 Green bean casserole is my favorite and this version looks AMAZING! Hi Kimberly, I’m so excited that I came across this recipe. After reading all the reviews, I feel very confident about making it for Thanksgiving without a trial run. However, I do have a question. Do you use unsalted butter and low sodium chicken broth? I’m worried that by adding 3/4 teaspoon of salt plus the salt from the bacon that it would be too salty if I don’t use the unsalted butter and low sodium chicken broth. Thanks for any suggestions that you can give. I’m so glad that I came across your blog. Awesome, Dave, thank you! So glad you rocked that potluck!! Hi! I am making this for TG but I am wondering will the green beans cook more in the oven so they aren’t crunchy. My family likes them soft so if they will still be crispy can I just boil them longer before blanching? Also, if I use shallots instead of onions do I use the same amount? Hi Wendy, I wouldn’t describe them as “crunchy” but they’re not squishy soft either. Yes, they do continue to cook more in the oven. If you don’t like even the tiniest bit of crunch to your beans then to play it safe go ahead and boil them a little longer. You can use shallots if you prefer. Shallots are sweeter and milder (hence commonly used raw for salads, dressings, etc) so no problem with using an equivalent amount. Kimberly, I had a question about the blanching time. Most other green bean recipes involving blanching recommend 2 minutes. Five minutes is quite a lot longer- is there a specific texture I’m looking for? I don’t want them mushy. Thanks for any advice, I’m really looking forward to trying this Thursday! Hi Valerie, they won’t be mushy, they’ll be soft. Most people don’t want a crunchy texture in a green bean casserole but if you prefer a bit of crunch go ahead and reduce the blanching time. Happy Thanksgiving! Hi Terry, yes, double everything. Happy Thanksgiving! Hi Sandy, I would assemble it all (without the onions), refrigerate it and then bake it on Thanksgiving, adding the onions just before you put it in the oven so they don’t get soggy. Happy Thanksgiving! Thank you so much for your prompt reply. I am so happy I could prepare it two days in advance without a problem and then bake it on Thanksgiving day . I want to make it so bad and I was afraid preparing it in advance wouldn’t work. Thanks again. Hi was wondering if we can use cream of mushroom soup in this? Hi Farah, yes you can, it just won’t taste nearly as good as using the fresh ingredients. No! I accidentally bought heavy whipping cream. Can I use it instead of half and half? Yes absolutely, Brooke! It will just be all the creamier/merrier :) What you can also do is just use half milk and half heavy whipping cream and you’ll have the same thing as half and half. I am going to make this to bring as a side dish for tomorrow night “early thanksgiving”. If I prepare it tonight “everything but the onion topping”, will it be okay for tomorrow? Also, I bought a tin baking dish. Will that change the flavor at all? Hi Malarie! Yes, you’re are good to go, tin dish and all. Just add the onions just before you slip it into the oven. Happy Thanksgiving! After reading all the exceptional reviews, I am so looking forward to making this for a potluck at work on Thursday. I will be baking it at home but my travel time to work is 1 hour and probably won’t start eating for another 2 hours later. If I warm it up again in the microwave right before we eat do you think the onions will get soggy? Any suggestions would be greatly appreciated. Hi Debra, they will get soggy if they sit that long, there’s just no avoiding that. BUT it’s still going to taste awesome. I’ve had many readers report that they’ve traveled with this to potlucks and it’s been a huge hit. Happy Thanksgiving! I have made this a few times and it is always a HUGE success. Thank you so much for this recipe. I want to thank you for this delicious recipe. It is now the #1 requested dish from my family for holiday dinners. It has been a staple for us since 2014. Thanks so much, Kristy, I really appreciate that! Happy Thanksgiving! Hi Tami, this recipe is sure to win over the dinner guests – Happy Thanksgiving! I forgot to Blanche the green beans and put them in the sauce!! ;( is there a way to save it?! Hi Kim, the only thing you can try is to bake the casserole for a while first before adding the onions to soften up the beans. Cover the casserole with tin foil (so the liquid doesn’t all evaporate while the beans are cooking) and bake for a while – test a green bean for doneness. When they beans are done sprinkle on the onions and then bake uncovered for a few more minutes until the onions are toasted. This is now a thanksgiving tradition in our home! So good that I’m making twice as much this year in hopes of leftovers!! That’s the spirit, Kristin! :) Thanks so much and Happy Thanksgiving! Thanks, Anna, and thanks also for the tip! Happy Thanksgiving! I could not find white cheddar cheese… only sharp white cheddar cheese :/ what other cheese do you recommend to use? Sharp white cheddar is perfectly fine, as long as you like sharp cheeses. As long as you like the flavor of the cheese, you can really use any kind you like. I have been making a similar version of this for years. I know you say this is the “best ever” but I think mine is, so does anyone who eats it! I HATE mushrooms but can stomach the soup so I do use it. But I have been adding the bacon, onions and fresh garlic. I also put some of the fried onions in too, not just on top. I use nutmeg, basil salt and pepper for that extra kick. I will never eat another boring old imple green bean casserole again. Hi Vickie, try it with the cheese, that really takes it over the top! For the last 5 or so years, I’ve been responsible for making/bringing the green bean casserole. I’ve tried several recipes over the years trying to find the “right” one. The others weren’t bad, but they were lacking something. This year I thought, maybe it’s missing bacon, cause what’s NOT better with bacon??? So after putting in bacon green bean casserole in Google, I came across your recipe and all the positive reviews gave me comfort that although it was the 1st time trying/making it (and I had no backup plan), that the result would be good, and I was right. So many people got more today when going back for seconds and commented how good it was (even my 5 year old nephew). I’m done searching green bean casserole recipes. This will be the one I make every year going forward! Thanks! This. Was. Delicious. A total hit. I omitted the onion because I loathe onion, and I substituted parmesan cheese for the white cheddar (only because I couldn’t find white cheddar) and it was still amazing. The family demanded I bring it to Christmas dinner as well. You don’t have an equally amazing sweet potato dish recipe by chance? Lol thank you so much for posting! In 2015 I made this recipe for my family of 21 and tripled it the only difference is I added about a third can of condensed cream of mushroom soup I know that’s a faux pas, but I added it for sense memory. It was a great hit. Even people that don’t care for green beans absolutely loved it. This year I was pressed for time and did not make it. You would have thought I committed the greatest crime ever. Needless to say I will be preparing it from now on it truly is the ultimate green bean casserole! !!!!! This is a fantastic recipe. I have always ‘avoided’ making this casserole dish because of the typical canned ingredients. I will make it again and again! Thank you! That’s terrific, Lorrie, thanks so much! This recipe is absolutely YUMMY!!! I am glad I came across this recipe while searching for something not out of a can. This was my first time trying this recipe and I must say I was pleasantly surprised how delicious it was. Everyone at the table was asking who made the green bean casserole and wanted the recipe. This casserole will definitely be a permanent dish in our holiday dinners. Thank you for an awesome recipe. Thanks so much, Wanda, I’m thrilled to hear that! Hi! Instead of the bacon, can I use real bacon bits? Also, can I use yellow instead of white cheddar? Hi Connie, yes, you can use yellow instead of white, white is just a little more attractive in this. Using fresh bacon and frying it is key though because of the bacon fat it renders – that’s where so much flavor is. Thankyou-thankyou!!!! Made it for Thanksgiving and was absolutely delish. The name says it all….Will definitely be a holiday staple, but I have a feeling will make it several times a year, why wait?? That’s the spirit, Paige! :) Thanks so much! This. is. awesome!! Love it! Thanks for posting this! I’m making this now. I sampled a taste before putting it in the oven and it’s DELICIOUS! I will use this recipe from now on. Awesome, Lesleigh, thanks so much for the feedback! Thank you for this recipe, made it for thanksgiving and was a big hit. We haven’t had it since my mother was diagnosed with celiac. Not hard to change out flours from wheat to gluten free mix and used crushed chip in place of fried onions (which works out since my sister hates those onions). Turned out great and made figuring out a vegetable easy. Thanks again. That’s wonderful, Joseph, thanks so much for the feedback! when it comes to the white cheddar cheese, do you suggest using mild, medium or sharp? Hi Dana, that just comes down to personal preference. Speaking for myself, I love strong cheeses of all kinds, so I wouldn’t hesitate to use sharp. That said, not everyone at the dinner table may feel that way so you’ll need to gauge it based on your dinner guests. It will taste fabulous no matter which one you choose. Happy cooking! Made this for Thanksgiving and it was fantastic! Making again for Christmas. My new go-to for green bean casserole. Thank you! That’s awesome, thanks so much, Keri! I normally don’t comment on recipes at all but this, I just had to comment on how delicious it was!! This is probably the best green bean casserole I have had in my life. The ingredients were simply perfect for the dish and the bacon compliments the dish very well. It’s kind of hard to explain the flavor, but it was excellent! It’s pretty easy to make but it takes a little time to make. The results are tasty and well worth it. ;) I actually doubled the recipe and I even used frozen green beans, which turned out well, if you don’t have fresh ones on hand. This is probably the only way I’ll make green bean casserole from now on! That’s awesome, Asha, I really appreciate your taking the time to leave us feedback. I’m thrilled you enjoyed this as much as we do. Thank so much! THE BEST GREEN BEAN CASSEROLE EVER!!!!! Trust me on this. Just try it. Been making this exact recipe for about a year now for every family gathering. And its what everyone talks about. Absolutely the greatest green bean casserole my family and i have ever had. Will be my go to for years to come. Thank you so much. That’s super awesome, Doug, thank so much! I was never a fan of green bean casserole, but it was a holiday staple in my boyfriend’s house and I knew it was something that I would always have to make even though I wouldn’t be eating it. For Easter this past year, I decided to look for a recipe sans condensed cream of mushroom soup and stumbled upon this one. I’m a vegetarian so I used Quorn veggie bacon cooked in some olive oil with some smoked salt thrown in. When it was time to load up my plate I got a heaping of everything else and the smallest serving of green bean casserole you’ve ever seen. Once I tasted it I knew I would be heading back for seconds. IT WAS SO GOOD. My boyfriend loved it more than the kind his mom made (which is always such a compliment). My whole family enjoyed it. While my boyfriend was happy that I liked it, I think he was a little bummed that he had to share the leftovers with me. I made this again last night without onion as I didn’t have one on hand and the flavor was still amazing. I never comment on recipes, but I just had to share how much I enjoy this one! 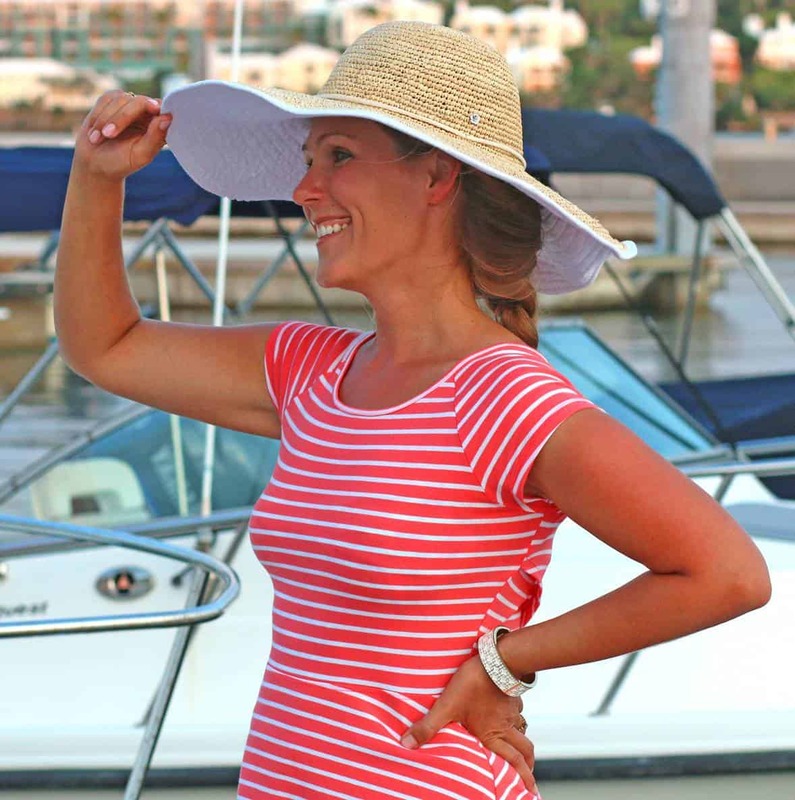 Hi Jenny, I really appreciate your taking the time to comment and am so happy to hear you enjoyed this – thank you! Thanks so much, Miata, I appreciate the feedback! Made it. Loved it. I can’t stomach green bean casserole of the canned variety, and therefore was desperate for something edible. This was not only edible, palatable, and aesthetically pleasing, it was delicious! And the traditionalists enjoyed it more than the canned soup abomination that they thought they favored! In a word – success! Fantastic, Sarah, thanks so much! Agreed! It was a total hit in our home on Easter, the dish was licked clean, and we’re making it again tomorrow! SO good! This looks fantastic. Can I make it now and freeze for Thanksgiving? Minus the crunchy onions, of course. That’s a good question, Monica. I haven’t tried it so I can’t comment how that will impact the texture – perhaps some of our readers have tried it and can offer their insights. Do you drain the bacon fat or do you use it all? Hi Jessica, there’s no right or wrong here, it’s strictly personal preference and it also depends on how much bacon fat the particular bacon you’re using yields. I personally like to leave at least a couple of tablespoons of bacon fat in it for flavor. Hi Jeff, yes, the onions will lose their crunch. If it’s an option to precook the casserole at home and then add the onions and bake it for a few minutes once you get to your in-laws house, that would be ideal. If not, this casserole is still going to be the star of the show, even if the onions lose their crunch! My husband is allergic to cheese – it makes him sick. I would like to make the recipe but instead of the white cheddar, can I substitute heavy whipping cream? Hi Alena, just leave it out. Don’t add more cream or it will make it too runny. Happy cooking! I made this last year, tripling the recipe for thanksgiving and had nothing left but an empty pan. My family has requested that I bring it again and I can’t wait to eat some myself. I am also cooking this for a potluck at work. Thank you so much for your wonderful recipe! Wonderful, Chris, thanks so much! With the exception of hydrogenated fat (which this recipe doesn’t have), there’s nothing unhealthy about fat. That myth has finally (and thankfully) been debunked. As for salt – and as with everything else – it’s all about portion control. What would be a good substitution for the onions. My daughter is breast feeding and cannot eat the onions. What would you suggest for another topping? Hi Linda, for some crunch you can use breadcrumbs or torn up pieces of bread/croutons. I’ve been making this for two years already and thought it high time to finally let you know THIS IS THE BEST GREEN BEAN CASSEROLE EVER!! Making it again tomorrow. THANK YOU!! I made this last year and it was a HUGE hit, probably the highlight of the entire meal! My family can’t imagine Thanksgiving or Christmas without this anymore and are excited to have it again tomorrow. Hands down, best green bean casserole ever!!! It’s just yum! I tripled the recipe the first time and had a massive amount in a large dish and my family gobbled it up. It’s a comfort dish, and comes highly recommended for the holidays! One of my family’s Thanksgiving traditions involves sharing what we’re thankful for at the table before we eat. This year, even though I didn’t share this with my family, I was thankful for Daringgourmet.com. Rather ambitiously, I decided To make everything from scratch this year. I googled “green bean casserole from scratch” and to my delight, I found this recipe. Over the past week I’ve made no less than three recipes from this site and all have been delicious. This green bean casserole was no different. While I was whisking the roux, my grandma called. She heard the commotion in the background and asked what I was doing, I told her I was whisking a roux for green bean casserole. “Oh honey, you don’t have to do that!” She replied. “I know grandma, but I want to” I said. 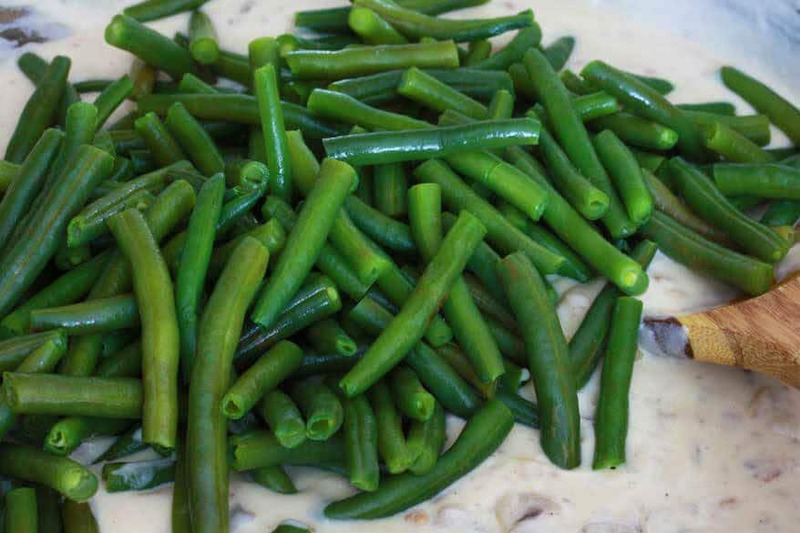 There was no shortage of green bean casserole recipes using cream of mushroom soup, but I wanted to put in extra time to ensure that this meal stood out, and wasn’t just another Thanksgiving meal with the same old dry turkey, and cookie cutter casserole. Mission accomplished. Everyone who ate it, raves that it was the best green bean casserole they’d ever tasted! Putting in that extra bit of work, really made a difference, and the compliments made my day. Thank you Kimberly, I know my family is thankful for your recipes. Yes! This was definitely THE best green bean cassarole! Mushroom n bacon? Who cannot like it! Hands down the best green bean casserole I’ve ever tasted!! I made this last night for dinner and it is so worth the time and effort. Thank you for such a delicious recipe! Wonderful, Rosa, thanks so much! I made this delicious dish for Thanksgiving dinner this year. Hands down, it was the most delicious green been casserole any of us ever had! Our family is gluten free and casein free as well, so I used gf flour and dairy free cream. I subbed 1:1 as I followed the recipe. It worked beautifully. This recipe is a keeper!! Awesome, Kimberly, I’m so glad, thank you! i will be making this for xmas and am very excited, i was wondering if there is s difference in using white cheddar or sharp white cheddar, and which did you use? thank you! Hi Katie, you can use either, it just comes down to personal preference. If you prefer eating mild cheese go with mild; if you like sharp cheese you can go with sharp. I’ve used both and it tastes awesome either way. Could I leave out the bacon or cheese? Have you heard of this making a difference? I’m not a big fan of bacon outside of breakfast ( I know I’m probably the only one) and already have a few cheesy dishes planned so I’d like a contrast. Hi Chelsea, the bacon and cheese are what really make this dish extra amazing. If you’re worried about this clashing with your other cheese-based dishes, it won’t – I wouldn’t consider this a “cheesy” dish as the cheese melts into the sauce for flavor without being remotely gooey. But yes, if you prefer you can certainly leave out the bacon and cheese. Ok… I will give it a shot. This a favorite of mine, but I like the idea of kicking it up a notch. The best green bean casserole in the world!!!!! And I sincerely meant that. I’ve been making this the past two years and it’s always a HUGE hit! To other readers, the Lars Crispy Onions are a little more expensive, but absolutely worth it; I would never use any other kind again. Going into my 4th time making this. I wanted to make sure I thanked you! What inspired you to come up with this? You’ve made my day, Jennifer, thank you! The inspiration? I’ve never been a fan of the typical condensed cream of mushroom soup green bean casseroles and wanted to not only develop one from scratch but bump it up several flavor notches – thus the “ultimate” green bean casserole was born :) I’m so glad it’s been such a hit in your family, thank you! I can’t possibly rate this recipe highly enough, it deserves an A++++++!!!!! ABSOLUTELY AMAZING!!!!!! EVERYONE LOVED IT!!!! PHENOMENAL!!!!! That’s the best word I can think of to describe this. Truly the BEST green bean casserole in the world!! Fantastic, Kate, thanks so much! 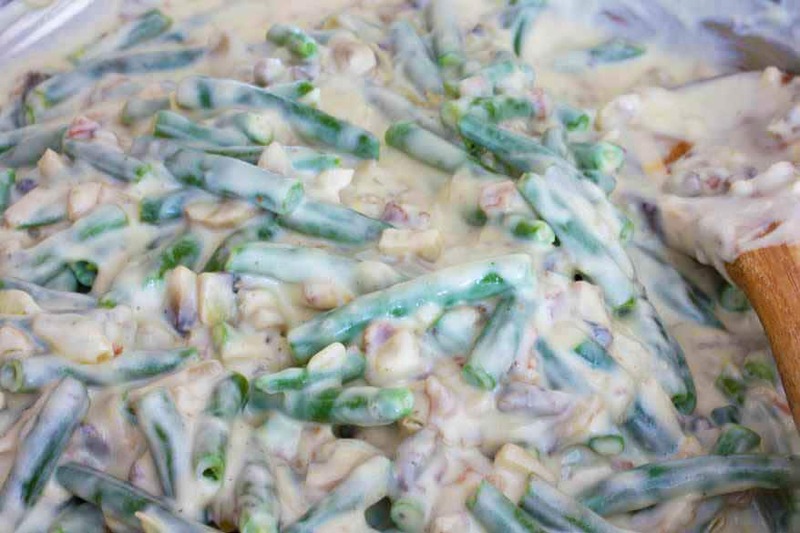 With Easter around the corner, I’m always in charge of green bean casserole and tired of the same old traditional recipes, but with a room FULL of picky eaters can I change the fresh or frozen to canned? My family doesn’t like crunchy beans as funny as it sounds and they also don’t do mushrooms or chunks of onions can I substitute with onion flakes? Hi Melissa, sure you can use canned beans and onion flakes will probably be okay, too. Oh I am so glad, Mary, and really appreciate your experienced vote of approval, thank you! Fantastic..made this for a dinner party, I got rave reviews…I gave to credit to The Daring Gourmet…Thank-you for a great receipe! I’m thrilled to hear that, Cynthia, thanks so much! Hi! 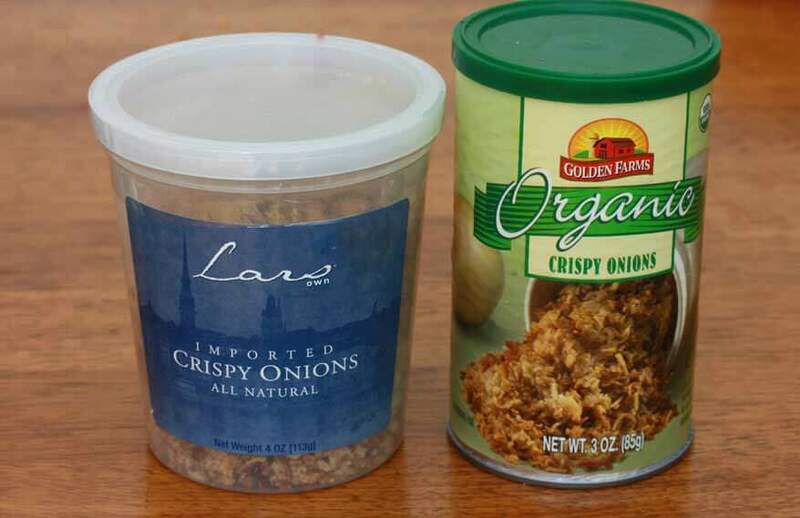 When you order the 3-pack of Lars onions, do you use just one of the three on the casserole. Each container is 4oz. The recipe doesn’t say exactly how many ounces to use on the casserole. Hi Wendy, great question. How much you use just comes down to personal preference. Personally, I love the French fried onions so I tend to be generous but one 4 ounce container is enough to provide an even layer over the casserole. Thank you, Kelly! I’m trying to think of something you can make that’s crispy without using any flour for frying but nothing comes to mind. But yes, I think omitting them is fine, the flavor of the casserole will still be phenomenal! Have a great Thanksgiving! Do you have to use flour in this recipe? What if you just add all the ingredients but no flour? Will it change the consistency/flavor? Hi Amy, the flour is strictly used as a thickener. Without it the flavor will be exactly the same but the consistency will be very runny. If it comes down to a gluten issue you can also thicken the sauce up with cornstarch prior to pouring everything into the casserole dish. Hi Kasey, I would probably make 4 batches and I would make them a day in advance minus the French fried onions. Prepare the casseroles as instructed to the point where you pour the mixture into the baking dishes, then cover with foil and refrigerate until you’re ready to bake them. Then take them out of the fridge and let them sit at room temp for 30-60 minutes to warm up a bit, then add the French fried onions and bake as instructed. You should be able to fit two casseroles on two oven racks for a total of 4 or if you have a double oven even better. Hi! After reading through the recipe and comments, I’ve decided it looks like a crowd pleaser. Here’s my dilemma… I’ll want to make it for Thanksgiving, but my Dad doesn’t like cheese and my husband doesn’t like mushrooms. Should I find another recipe or can this be successfully modified? Hi Kathy, you can simply omit both, no other alterations necessary. I hate green bean casserole with ALL MY HEART! Every year for Thanksgiving my mom asks me to make it. No one eats it except her! I will always make it even if it’s just for her! But, I’m SUPER excited to try this recipe and hope EVERYONE else enjoys it too! Thanks so much! Lol, Stephanie! You’re such a good daughter :) Okay, you’ve GOT to report back and tell us whether this won everyone else over!! Love this casserole! We don’t use mushrooms so I forget how we handle the onions/ garlic mixture- still sauté for the full time? Thanks, Tina! Just sauté the onions until they’re soft and translucent and then add the garlic and sauté for a couple more minutes. My friend made this for Friendsgiving and it was phenomenal! I don’t usually like green bean casserole because I don’t like canned ingredients. That being said, I’m trying to make it myself and my math teacher brain is making it more confusing than I think it should be lol. I brought a container of mushrooms which was 12 oz weight. The recipe calls for 12 oz… so, I’d this weight or 1 1/2 cups? Thank you for your help!!! I made this for Thanksgiving this year and everyone LOVED it. Thank you for sharing this amazing recipe. Question: If I wanted to make cream of mushroom soup, could I just follow all the above steps steps before stirring in the green beans? Or should I do something different to make a soup? Absolutely love this dish. I made it for thanksgiving and everybody loved it! This will be my go to signature dish come Christmas this year. Its the perfect side dish to almost anything. Especially cooked salmon! Oh and the Minestrone soup, its totally delicious and easy, it was the perfect winter meal. Tell you what, I can’t fault anything! All this I’ve now made from just discovering your potato gratin recipe a few months back! From the Aussie Downunder! You have changed my cooking forever.. not to mention made my friends very jealous ;) ! This was a spectacular smash. Didn’t change a thing and made it exactly as written. My wife went back for seconds and she doesn’t like green beans. She even asked me to make it for a social function next week. This is now part of my repertoire. THANKS for a fabulous receipe. Fantastic, Pete! That’s what I love to hear, that an otherwise green bean hater has been converted :) Thanks so much for the feedback! Ohhh my! This is a winner. I made two of these. However one I omitted the bacon and chicken broth and used veg broth and oh my…. I added a bit more butter for the fat content and actually thew in some pino grigio into the sauce. Outstanding. Awsome recipe especially to play with and get such great flavors!!! Fantastic, Kyle, thanks so much for the feedback! I’ve made this dish five times now — its a hit every time! This year I changed it up a bit and used leeks instead of onions and frozen French cut green beans. Also, I had to use breadcrumbs on top as I forgot dried onions and I was too lazy to make my own….But it was better than ever. This has become one of those dishes that people always ask me to make! I love it! That’s so awesome, Judy, thank you for the feedback! I love practically anything with leek and have no doubt that’s a delicious addition!